Departing Hanoi we journey to Ha Long City. We follow its fertile road through flatlands of the delta flanked by endless green carpets of rice paddies. 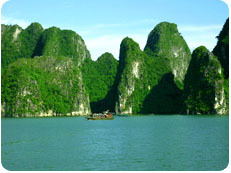 We then head north to Ha Long City then to Cai Rong Island. Here, we embark on a junk trip and paddle our kayaks among the spectacular limestone peaks – time to relax and appreciate the sublime beauty of the bay. 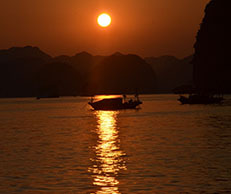 Arriving on Quan Lan Island we stay overnight with our lodge. (Lunch and dinner are included). This morning we cycle across and explore the northern part of the island, the best way to see all the sights, staying close to the land and it's inhabitants. We visit the local people and soak up the village atmosphere and lush farmland, verdant hill surroundings and breathtaking sea views. Weather permitting, there is time to relax and unwind on the pristine beaches. Later in the morning, we board our boat to discover the extent of the region's riches. The return journey follows a different route, allowing us a few hours to appreciate the tranquil beauty only found in Bai Tu Long Bay. Following that we make our way to Halong Bay. 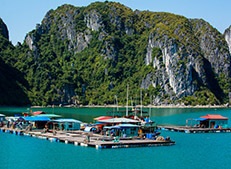 Upon our arrival we embark on a boat trip among some of the spectacular limestone peaks – time to relax and appreciate the sublime beauty of the bay. Those are feeling energetic and wish to get a close view of the scenic rock formations can take a delightful kayaking ride around the village. A morning boat trip brings us to some of the bay’s truly awesome scenery – vertical and unusual rocks and islets emerge from the sea. There will be an opportunity to take a kayaking ride among scenic rock formations. This is followed by our journey to Cat Ba Island for the night in a hotel. (Breakfast, lunch and dinner are included). 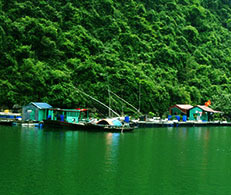 Today we hike to explore Cat Ba National Park before we make our way back to Hanoi, arriving there at about 5pm. (Breakfast and lunch are included). - a 1-hour bicycle ride on Day 2. - a 1-2 hour kayak ride on Day 3. Transport: boat, bicycle, kayak and minivan. Tour guide(s): all of our friendly tour guide(s) speak fluent English. They are knowledgeable about local culture, history and the environment. Accommodation: 1 night in a lodge, 1 night on a boat and 1 night in a hotel. We choose local ingredients, typical of the way people eat in the area, at local homes, restaurants or markets. (We cater for Vegetarians). 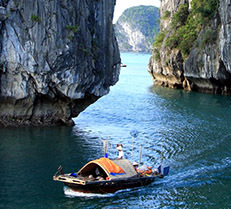 Trip cost: $256USD per person for a group of 10 to 14 people maximum. The cost of the trip includes: accommodation, transportation, tour guide, all meals, entrance fees and permits where applicable. The cost of the trip does not include: travel insurance, drinks (soft drinks, alcohol, bottled water) and personal expenses. 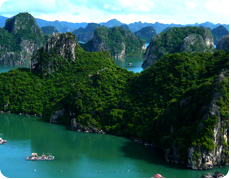 What to take: pack essentials for 4 days away from Hanoi, including light comfortable clothes suitable for outdoor activities, comfortable walking shoes. Take a small day pack for cycling and hiking.